Last Thursday, my doctor gave me a prescription for Evening Primrose, which I was supposed to take three times a day. It was supposed to help “ripen my cervix”. I have no idea what that means. But I guess it was because I wasn’t dilated at all. And then, over the weekend, I had another ultrasound (BPS) and non-stress test. The non-stress test showed that I had two moderate-strong contractions in 30 minutes, but I didn’t feel anything. I was asleep for most of the test and I was surprised when the nurse asked me if I was feeling okay. This morning, when I got up to pee, I noticed a small drop of blood when I was cleaning up. It was so tiny, like a needle point. We wondered if we should go to the hospital, but I told Mikey that maybe it was just a fluke or something. Soon after that, I received a text from my doctor’s nurse asking me to take 30 ml of caster oil this morning. I think that’s where it all started. We left our apartment to buy some castor oil at the drug store and have breakfast at Aristocrat. Before our food arrived, I took a swig of the castor oil. It wasn’t so bad! It was citrusy and lighter than I expected! The castor oil is supposed to encourage contractions because it’s a laxative. It’s also supposed to make you poop a lot. Hehe. Mikey was worried that I might have to run to the bathroom right away, but we had a normal, pleasant breakfast. 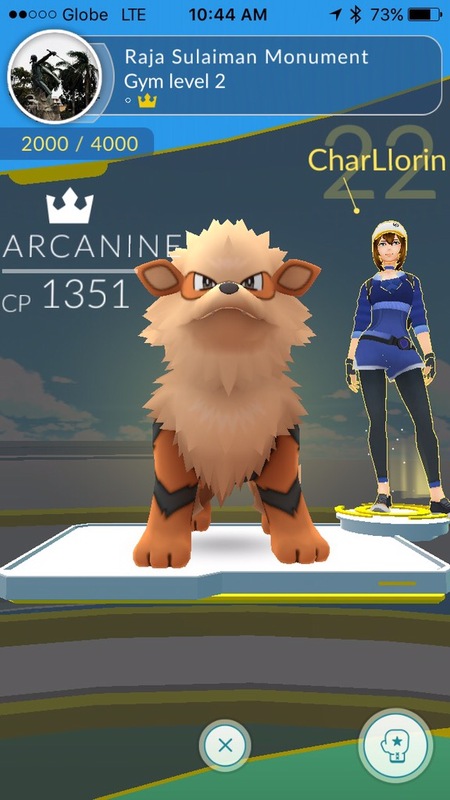 I even took over a Poké Gym! When we got home, I was unusually tired, so I took a nap. At around 2:00 PM I woke up with a really bad stomach ache and I thought I that needed to use the bathroom. So I sat there for a while but nothing was happening. When I cleaned up, there was blood again and it wasn’t just a needle point this time! I woke up a sleeping Mikey with: “we need to go to the hospital”. He got up automatically and we left right away. On our way to the hospital, I experienced the most intense contractions I’ve ever had. I actually noticed it! It felt like a really bad constipation that radiated to my back and then my thighs. They were pretty close together. In our 20 minute car ride, I had a 4-5 contractions. By the time we got to the hospital, I was tired. The kind guards even gave me a chair to sit on while waiting for the elevator. When we got to the delivery room, we were asked to fill up some forms and answer a bunch of the nurse’s questions. Then they hooked me up to a machine (to measure the contractions and Squishy’s heartbeat) and gave me an internal exam (for some reason, it was really painful! It’s never that painful when my doctor does it). After about two hours, they told me that while I did have bloody show and my contractions were regular, I was only 1 cm dilated. So they sent us home and asked us to come back tomorrow morning to assess the progress. They usually only admit patients who are 4 cm dilated. Sigh. Today was not the day. We had a yummy dinner at Hossein’s which took long because I could only eat and talk in between contractions. This worked really well for Mikey because he ordered a lot of food (this was his lunch and dinner rolled into one meal). For the first time ever, we finished eating at the same time! After dinner, we walked around. After 7 hours of experience, I therefore conclude that contractions are easier to handle when I’m standing/walking! Maybe it’s because contractions are supposed to help the baby get into position? And when you’re walking/standing, there’s less struggle. The pain was most intense when I was lying down. There’s some relief when I’m sitting, but even in that position, the intense part of the contractions would take my breath away. But while I was walking/standing, I could converse through entire contractions. Since Tuesday, the Sperm Donor has been praying for Squishy to stay put until Saturday morning. Why? Read all about Mikey’s #WWEManila adventure here. The third trimester is essentially the first trimester on steroids—at least that’s what all the books, apps, and websites say. From our experiences though, the third trimester’s day-to-day (so far) has been easier than the first trimester. Don’t get me wrong, the third trimester has been challenging (mostly physical), but that’s much easier to cope with compared to the emotional sledgehammer that was the first trimester. Maybe pregnancy was intelligently designed to be that way? As you go through it, you learn to adapt and assimilate to the new challenges and you come up with your own repertoire of pregnancy hacks. I’m a gigantic blue whale right now at 39 weeks. But Squishy is a happy camper and I’m a happy tent, so I really shouldn’t complain so much. There’s one thing that’s been extra challenging, though: sleep. Specifically, sleep at night. When I sleep on my back, I feel like I’m drowning and I lose my breath. The most optimal sleeping position is on my side. But now that I’m so huge, my bulging belly acts like an anchor and any shift makes it feel like my belly could fall off like a backpack. And it doesn’t help that Squishy has recently taken a liking to my ribs. I wake up in the middle of the night to try to prod him to a different position because it feels like he’s going to crack them. Oh, and let’s not forget the neverending need to urinate. I often wake up feeling tired and bruised. But there are some tricks that have helped me sleep better at night! Pillow Taco—When I finally find a position that’s comfortable, I use pillows of various sizes to help keep me in that position. Normally, I end up looking like a taco with several pillows stuffed along my sides. Light dinner + chores—Heading to bed stuffed makes me feel sleepy but makes it more difficult for me to find a good sleeping position. If I have a particularly heavy dinner, I try to get in some light chores before heading to bed to work away some of the heaviness. Don’t force it—At first, I would get frustrated and exert so much energy in trying to fall asleep after waking up in the middle of the night which would then wind me up some more. When I finally stopped fighting it, I would just read or play games on my iPad until I fell asleep again. Ultimately this became more productive and restful. I think it also really helped when I adjusted my expectations. In the third trimester, I realized that rest doesn’t always come in the form of sleep, and 3-4 hours of uninterrupted sleep is heaven sent! I try to compensate by finding other restful activities I can do throughout the day. And I’m really grateful that I can take it easy and take power naps whenever I need to. My last day of work was Wednesday, August 31. It was like any ordinary day at work. I mostly spent the day turning over last minute documents and tying up loose ends. I am now the human equivalent of a blue whale, so, for most of the day, I was more uncomfortable rather than emotional from sitting all day (especially since I had brought home all my pillows and my makeshift ottoman the week before). I only got emotional when I finally left my building and started walking towards the gate where Mikey was supposed to pick me up. I was feeling nostalgic and grateful. When I got to the gate and spotted Mikey’s car, I started waving like I usually do and then I realized that this would be the last time in a long time that we would be doing this. As soon as I got into the car, I started bawling. My emotions were eventually stabilized by Pancake House’s spaghetti and grilled cheese sandwich. And the fact that there was a whole lot of peace in this decision. So later on that evening, I was fine and I was even excited for this whole new world of work-from-home domesticity. And then Thursday came. Mikey left for work early in the morning and there was nowhere for me to go. I was still nursing my edema from the day before, so I spent most of the day in bed with my legs up. I answered a bunch of emails while watching old episodes of Grey’s Anatomy. When Mikey got home, I admitted to him that I wasn’t sure how to do this. I couldn’t get myself to fully goof off because it wasn’t the weekend and goofing off on a weekday felt indulgent and wrong. Also, because my edema was kicking up, I couldn’t do a whole lot of household chores. So I couldn’t even do the whole domestic goddess thing. Then I realized that I had the power to structure all of this free time! Make a to-do list! So, before I went to bed, I made a list of things I wanted to do: sort the laundry, make the bed, clean the kitchen, answer emails, cook, bake brownies, and take out some Christmas decorations. It was a good list. Thankfully, after resting all day on Thursday, my feet were back to its normal size by Friday! So before Mikey got home, I ended up doing most of it except the Christmas decorations (the boxes were heavy) and the brownies (I really didn’t want to eat the brownies, I just wanted to mix things in a bowl). When Mikey got back, he had a quick snack and helped me with the Christmas decorations. I realized that while I immensely enjoy solitary work at the office, it’s different when I’m at home. I have bouts of sadness when I’m home alone for long stretches (even when I’m accompanied by Meredith and Cristina). Maybe it’s because I’m used to having Mikey here with me when we’re at home during the evenings and weekends. When I lived in my apartment before getting married, I didn’t really have any problems with the alone time. But hopefully, this will only last a few more days! I’m sure that there will be plenty to do when Squishy is out! 😅 And as we’re playing the waiting game, our mothers have been more attentive. In fact, Lola is sleeping on our couch right now as I type this. She visited today to bring me more Pancake House spaghetti and keep me company while Mikey went to work. So far, no signs of Squishy wanting to leave yet! 😅 Last Saturday, we had another Biophysical Profile Scoring (BPS) Ultrasound and a new test, the Non-stress Test. The non-stress test is a non-invasive test that took about 30-40 minutes. They strapped on two monitors on my belly and it monitor’s Squishy’s heart rate, movements, and reactions to contractions (apparently, I had two mild contractions which I did not feel at all. In fact, I slept through most of it). While you’re strapped in, you get to hear the baby’s heartbeat echo through the room. 😍 It was magical! (Although the Sperm Donor described it differently 😑). When we got pregnant, Mikey and I kind of knew that we wanted to give birth in St. Luke’s Medical Center in Bonifacio Global City. It’s a relatively new hospital, boasts of world-class facilities, and it’s well integrated with our HMO. Surprisingly, when we inquired about the prices of the different hospitals on our short list, St. Luke’s was one of the more affordable ones. But more than that, I really appreciate how seriously they take breastfeeding and rooming-in. An added bonus to our St. Luke’s experience so far is their e-health services. While it still takes a while to get procedures done (especially when the procedures you need to do are in the Pathology Department—which on average takes about an hour to pay for your procedure and then another 20-30 minutes to wait for your turn to get the actual procedure done), I absolutely love how I don’t have to wait in the hospital to get the results! Every St. Luke’s patient can easily access the results of tests done in St. Luke’s in the last two years online. Normally, we go to either Pathology or the Women’s Health Center to get our procedures done (urinalysis, ultrasounds, blood tests, etc.) and when we’re done with the tests, we can go home! In about 1-4 hours (depending on the test), we can access the results online. The results can also be e-mailed so that you can have an easy-access copy for yourself. It’s wonderful! The doctor who requested for the test also has access to your files. So, in my case, whenever there’s anything wrong based on the test results, my doctor’s nurse will just text me and advise me on the next steps. That saves me another trip to the hospital! This feature is really helpful to modern and busy patients! I’m lucky enough to have a flexible schedule at work so that my check-ups/hospital visits don’t really count against me. But I know that most people would have to take a leave to accommodate a day in the hospital. The last test we did was an ultrasound with a Biophysical Profile Scoring (BPS)! 37 weeks onwards, the doctor prescribed a weekly ultrasound just to check up on Squishy and make sure that everything is still okay.